Having reviewed many of the films for 50 Kisses, one common thread is emerging. A lack of solid audio post production, and in particular, a lack of foley. The video below gives you a really good overview of a professional foley artists job – and you can do the same too. Foley tracks are created AFTER the edit has been locked and include human, animal and character ‘sounds’ that fill out the acoustic world of the story – typically footsteps, clothes rustling, putting down objects such as a glass, creaky floors, rustling sweetie bags, even breathing etc. One film submitted to 50 Kisses has been fully ‘foleyed’ by the film maker – you can watch Coltons Big Night below. Those footsteps were not recorded live on the day, they were added in post production, hence they are clear and crisp. In fact I suspect the only sound that was recorded on that day that is in this film is the dialogue tracks. Remember, aside from dialogue, what you hear is rarely what was recorded on the day. Sound effects in films (doors, squeaks, police sirens etc) are all pulled from libraries and added later too. Rarely sound form the shoot is used as its too poor quality. Atmospheres, (the audio tone of the room), is again pulled from libraries and added later, kind of acting like filler to cover the audio joins. So how can you do your own foley tracks at home? It’s actually quite easy and all you will need is a DVD (or file) player, TV, good quality camera with good microphone (and manual audio recording levels) some props, and a nice quiet place to work from. 1. Lock your edit. You don’t want to do your foley until you have completed editing. 2. Export your edit to DVD or a file that you can play on a TV in a silent room. 3. Make a long list of everything you need (your foley) to perform and record so you can put it into your film. 4. Gather your props – you will quickly learn that what sounds right in real life is rarely the original prop. You will also need some surfaces, such as a small paving stone, some sand and shoes. 5. 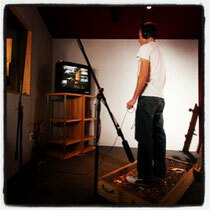 Set up your foley area a few feet form the TV, but in a place where you can clearly see the screen. 6. Setup your camera VERY CLOSE to your foley area (if using the onboard mic), but have it film the TV screen. Ideally you will use a separate microphone in which case you can keep the camera away from the foley action. 7. Set the audio levels on your camera so they record nice crisp tracks. 8. Watch a short sequence that you plan to foley, and rehearse a few times, doing the actions and creating the sounds. 9. Then do a take – film the TV and reporform the actions – be it footspets, clothes rustles etc and record to the camera – picture AND sound. 10. You may need to do multiple passes to get everything you need. 11. Move on to the next scene. 12. When you get to the end, take all this footage into your editing suite. 13. The picture is used only as a visual ident and for sync – you can sync your edit to the shot you filmed on the TV screen, thus getting immediate sync lock on your foley tracks (without this, foley is near impossible to post sync with domestic or semi pro kit). 14. You will need to make some editorial choices about taking stuff out as you will have unwanted or inappropriate sounds. Sut them out. 15. You will also need to slip the foley a bit as often your performance is a few milliseconds behind the action, so be sure to pull it back into full sync. 16. Once you start removing nasty on set audio and replacing with good foley, you will want to add better sound effects and atmospheres too. 17. Beware of mixing your foley too high in the mix. Watch your favourite movies and switch off the picture, listening to the sound only – aside form dialogue, most of what you hear will have been replaced in post – and often even the dialogue is replaced. This is your goal. Remember, audiences often forgive poor quality pictures, but rarely forgive poor sound. This website is my motivation, very excellent style and design as well as perfect content articles. I learn something new and challenging on sites.Everything is very open with a very clear clarification of the challenges. It was definitely informative. Your website is extremely helpful. I love the information in this post.Thanks for sharing with us.